Isn't it amazing how little, inexpensive things can bring you so much joy and terribly expensive things so much heartache? I act melancholy, I know, but we had to have quite the number of repairs done to my car this week. Instead of lamenting the expenditure I would much rather concentrate on what makes me happy. Of course I could go outside and enjoy the free (well, not exactly) flowers but instead I found joy in our cabinets. We keep many cows in our cabinets. Don't you? My two favorite pieces right now have a combined grand total cost of less than $4. Little Moo and Little Milk. It's very dairy the things that bring me delight. Little moo came to us by way of a hardware store somewhere nestled in Napa Valley. I can't remember where exactly (I'm pretty sure it was in St. Helena, like so much other good stuff). He was sitting among a pile of plates on a bottom shelf and practically lept into my arms while screaming "Moo! Adopt me!" So, of course, I had to! I'm an animal lover, it wouldn't be right to leave him there, motherless. Plus, his adoption rate of about $1.50, was something I could handle. Home with us he came and was soon united with some of my bigger, full sized cow creamers. 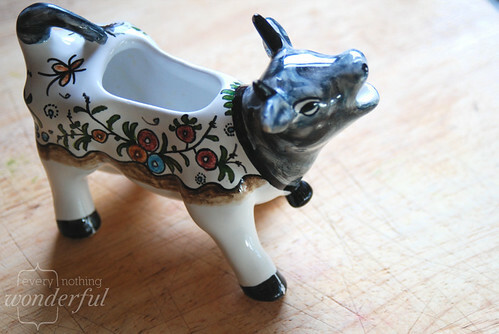 I do my best not to buy every cow creamer I find, but that doesn't mean I don't want to. We were limited to white only, no patterns, and only 3, but, I just inherited our first patterned cow creamer, and what might be one of the cow creamers that started it all - my grandmother's. 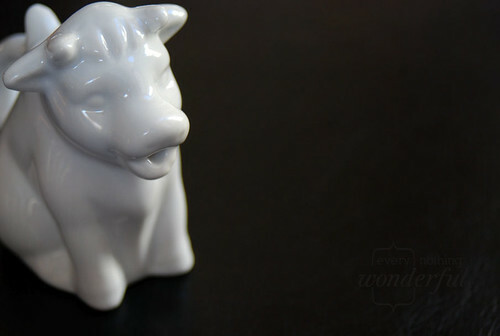 I blame my cow creamer love affair entirely on my grandmother, who, when I was little, would serve me cereal, in a bowl, with all the milk on the side in a cow shaped creamer. I loved it. I still love it. If I ate cereal more than once a year I might do it for myself. It's a genius idea, really. Little moo, who barely holds enough for a single cup of coffee or tea is my favorite though. For now. Fierce competition was recently posed though, for my dairy-obsessed, miniaturized versions of things creamer affair. 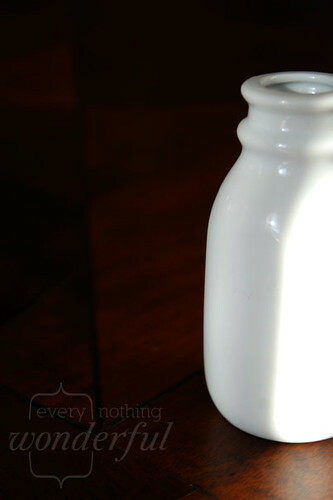 A little milk bottle. In white, of course. With a lid (so smart!). You have to understand, I am not one for impulse buys much - the waste and the money both bother me, so picking up this $2.50 creamer was a big deal. I love it. There is a bigger version I love too but I'm perfectly content with the small one and again, I love it. 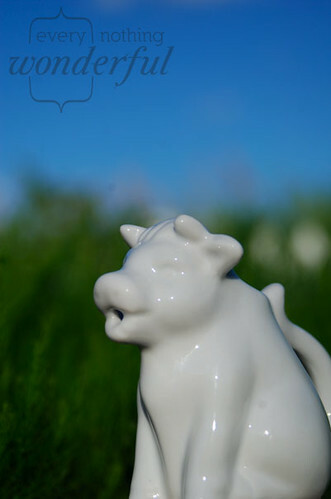 Do you have a cow creamer fascination too? I can't be alone in this adoration, right? What can't you resist collecting? Apparently it is apple week! Sunday = brunch. Brunch = eggs!